On November 29th, 2012, I flew from Boston, Massachusetts, to Moline, Illinois, to attend a three-day firearms auction that included 96 items from my father’s antique gun collection. While at the auction, I met author and historian R.L. Wilson (1939-2016). I introduced myself to Wilson, and told him that I was at the auction to see the dissolution of my father’s collection. 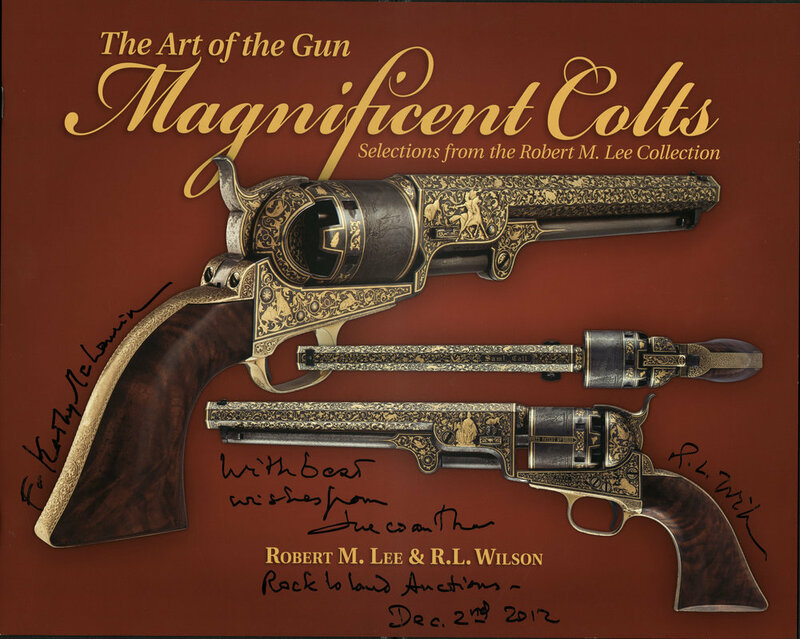 On the last day of the auction, I purchased Wilson’s two-volume publication The Art of the Gun: Magnificent Colts , which Wilson inscribed to me. Subsequently, I donated the books to the W. Van Alan Clark Library at Tufts University, School of the Museum of Fine Arts. This gesture acknowledged the long history of museums collecting firearms in order to represent “the highest artistic and technical capabilities of the society and period in which they were made” , including the Museum of Fine Arts’ own collection. It also materialized a conversation about gun ownership and the Second Amendment – which ultimately hinges on concerns of identity, desire, class, legality, and bodies in spaces. This project resulted in an installation of annotated auction catalogs accompanied by audio recording of the phone conversations I had with my father throughout the auction. 1. Robert M. Lee and R.L. Wilson, The Art of the Gun: Magnificent Colts. Nevada: Yellowstone Press, 2011.